Old Spice carried the day in our best men’s deodorant vote, taking down 35% of the more than 12,000 votes as of this writing. We also need to talk about antiperspirants and natural alternatives, so let’s get into it. Your most recommended Old Spice variant was Old Spice Pure Sport High Endurance, with the Fresh scent also being very popular. Old Spice Classic also received significant support. 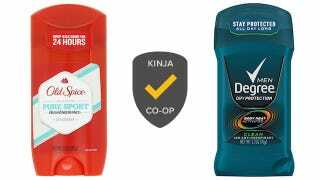 While Old Spice does make antiperspirants, they were not frontrunners in our voting. Old Spice is so popular that it finished in the top five in the women’s deodorant voting as well. Your most recommended antiperspirant was Degree, with the Degree Men Dry Protection Clean scent being the most specifically supported. None of the nominated frontrunners for best deodorant were natural or organic products, however the women’s vote had Arm and Hammer Essentials finish in the top five, and it’s an amazing product.